We’re serious about fun at Trabolgan, which is why our line up for 2019 is possibly the best yet! 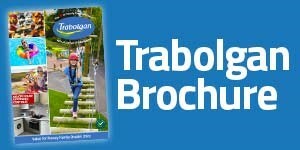 Check out the spectacular cabaret acts, live bands, parties and more available at Trabolgan! Family Entertainment with the Trabolgan TeamStars! Trabolgan Team Stars will star in their very own shows, as well as entertain the whole family with quizzes, karaoke and Trabolgan bingo with plenty of laughter along the way click for more! And everyone’s favourite, our very own Florrie the Fox will return with his party dance sessions. Florrie's best friends "Bonnie the Bunny"and "Wez the Weasel" and "Billy the Badger will join Florrie and all his friends in 2019 for a line-up that all the boys and girls will love! Peppa Pig and her little brother George and everyone's favourite little Princess Holly and Ben will return again for the 2019. There is always something happening at Trabolgan- so for a night full of fun, make sure to include our fabulous family entertainments venue, The Cove, in your itinerary.